Facebook and YouTube limited the publication of the famous American journalist and TV presenter Alex Johnson - the opponent of globalism, a supporter of traditionalism and patriotism. The United States has for decades used the freedom of speech as a powerful tool for promoting its interests, along with the dollar and armaments. But today it became clear that this freedom of speech in the era of Internet hegemony became such a threat to the "security" of the United States, or rather, of certain dominant elements, that it would be good to start limiting it. 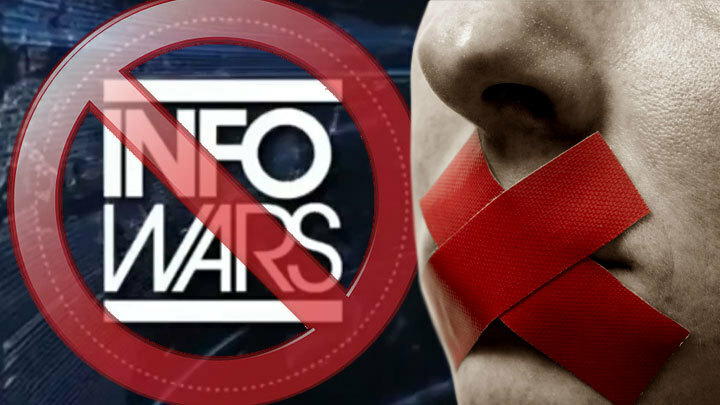 Journalist and TV presenter Alex Jones becomes the first serious victim of the fight against alternative media that over the past couple of years have been able to break through the blockade and the unipolar system established by the "mainstream" media, such as The New York Times, The Washington Post and CNBS. The Internet giants dealt a coordinated blow to InfoSars' Jones-based information site. First, Apple said that it removes InfoWars podcasts from iTunes and from applications. Then Facebook and YouTube, which Google owns, blocked the pages and channels of the journalist. Podcasts InfoWars also removes the music service Spotify. The arguments of the American corporations who declared war on Alex Jones are the same - "hate speech". They accuse him of fomenting violence, insulting migrants, Muslims and people of non-traditional sexual orientation. As an excuse for their actions, supporters of the blocking of InfoWars resemble the scandalous statements of Jones. In one video, the presenter claimed that Muslims were seizing Europe, while in another he compared transvestites with Satanists. Most of all, perhaps, the audience remembered the conspiracy explanations of the September 11 terrorist act and the shooting at the Sandy Hook school in 2012. The first, according to Jones, was organized by the US government, and the second -was staged. It is obvious that there are a lot of alternative sources in the US, as well as low-quality press, carrying not only fake news, but also frankly complete nonsense. But because of the high popularity - on YouTube, he had 2.4 million subscribers - it was Jones that hit the mark of Facebook, YouTube and Apple. The man who advocates the struggle against globalism, supports the anti-system leader Donald Trump, advocates for traditional and Christian values and is against migration. For its part, the InfoWars website makes it clear that its blocking in social networks is related to forthcoming midterm elections to Congress, in which the latest cyber technologies are trying to intervene. InfoWars, according to its authors, played a leading role in the election of Trump, who in an interview with the channel spoke about the "striking reputation" of the resource and promised "not to fail." In one of his speeches, Johnson named Robert Mueller, who is investigating the case of Russia's intervention in the American elections, "a demon whom I will beat at any cost." In another material, Johnson accused Mueller that he covers pedophiles. So, the attacks on Johnson are not only a blow to the First Amendment to the US Constitution, but also one more step to reduce the chances of Trump and his Republican party in the midterm elections.